Frozen bear on the featured image has nothing to do with anything, I’m just gave high five to him.. It’s like the new song from Dante, story tells about homeless guy from Bogotá who stole the dump truck, high respect from the idea. It has absolutely nothing to do with anything but it was meant to happen because ROCK ‘N’ ROLL never dies..! Story of the broken leg. Friend of my dropped by to my house, “coffee I seek..” he said. Well the door is always open for my friends. He also brought his kiddo who had broken leg and she was unhappy I must say. 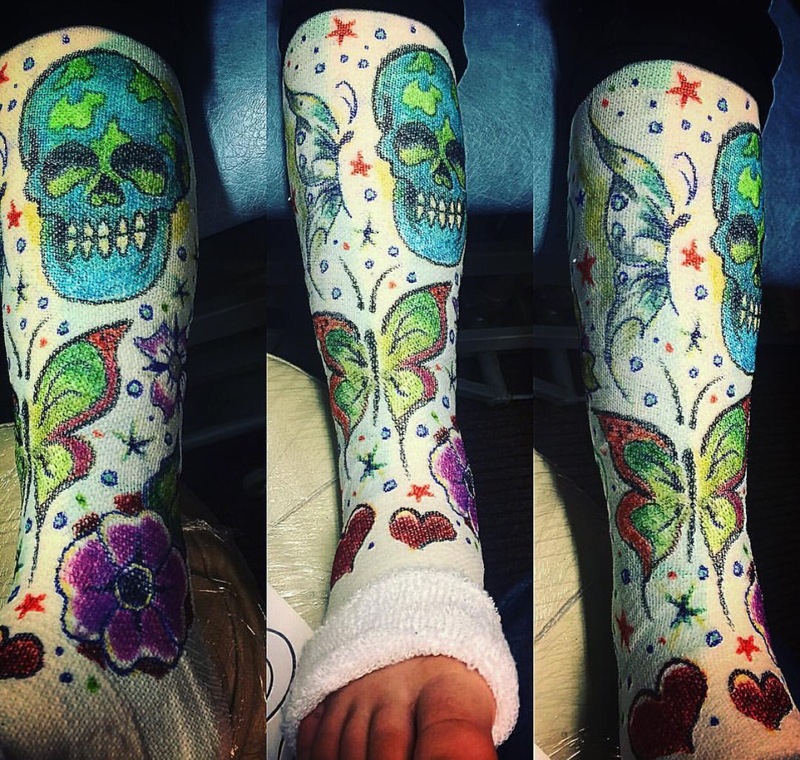 “Can you draw something to my leg cast?” She asked… Hell yeah, I could draw up something.. After one hour sketching with sharpies it was ready. Smile on her face was like an trophy..
After ten minutes we were already starting the stencil. Awesome idea for reminding about unlucky summer of his daughter.. Many different blue shades and about three different shades of green, hippies would say: “Greenpeace colors” Right.. It turned out pretty damn fine. So epic work to do and this I will remember long time.. what’s the odds for that you first draw it to the leg cast of kiddo, then tattoo shoulder for the dad.. LOL! Stay sharp people and never forget to ROCK! 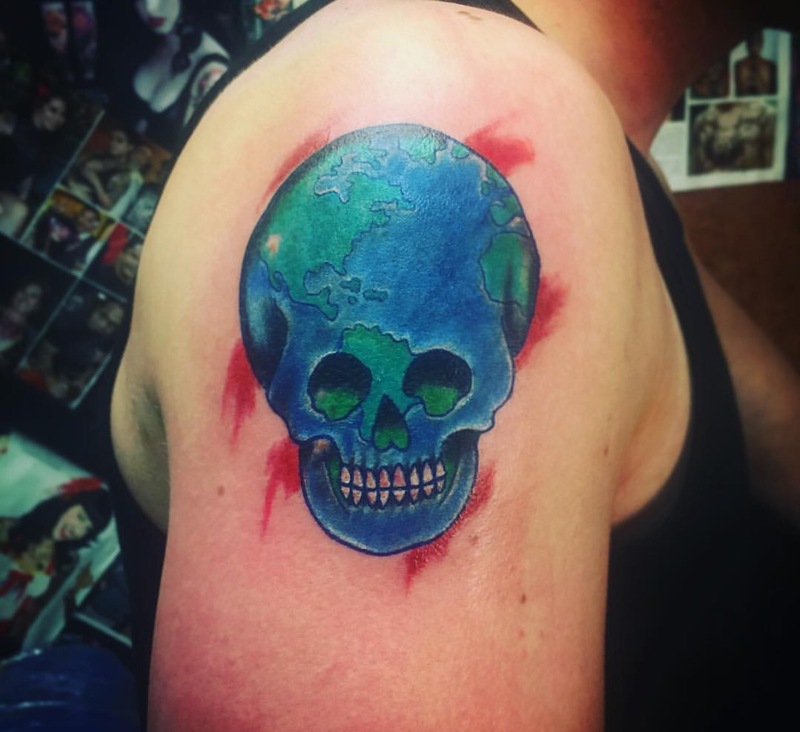 This entry was posted in Tattoos and tagged Tattoo. Bookmark the permalink.